All citizens of the European Union are equal and have the same rights. On 7th June the Primary school of Asvestohori organised an event dedicated to people with special needs with the motto: "Everyone different, everyone equal" . Pupils took part in paraolympic sports, talked to paraolympic athletes and got sensitized to the issue of people with special needs or special skills and our attitude towards them. The pupils of the 4rth class drew a poster about being different with the slogan: "United in diversity". The return of the "Enchanted"
On 18th April 2013, Day of International cultural heritage, pupils of 5th class from 1st Primary school of Asvestohori, decided to express their demand for the restitution of the “Incantadas” or “Enchanted”, the eight statues in the Arcade of Images that were stolen in 1864 and are exhibited in the Louvre museum in Paris. The pupils prepared a theatrical play which they presented in the “Ancient Market” a place which, during the Roman period used to be a social gathering point for the citizens to exchange views on every day matters and political, religious and philosophical issues as well. Also, the pupils presented a poster they had made for the restitution of the statues with the slogan: “We are Greeks and we want to come back home” Later, a representative of the pupils handed the poster to the Director of the Ministry of Macedonia- Thrace. On Tuesday January 22 2013 the pupils of 5th class of 1st Primary School of Asvestochori went for ” a journey in another time and space “.They travelled in Byzantium about 1700 years ago, when Constantine the Great moved there the capital of the Roman Empire. The challenge was big….. They had to draw, to engrave new borders, to get water and food and generally to satisfy the needs of the residents who the new capital would accommodate.So, they became landscapers, mechanics, craftsmen, gaffers, and under the emperor’s vigil look they made aqueducts, the Great Palace, the horse racing, the Agia Sofia, the houses of noble men and poor men. And most of all they secured the city with powerful walls, which made her impregnable for more than 1000 years. The result justified our young protagonists. The reconstruction of the City was so pretty that it had nothing to be jealous of the old Byzantine Constantinople. 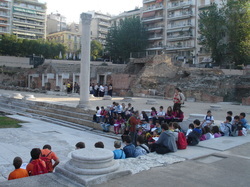 On Tuesday October 23rd 2012, the 5th class students visited the Roman monuments of Thessaloniki. The tour started from the Roman aquaduct water reservoir in Hortiatis which was built in the 1st century a.d. in order to carry water from the mountain of Hortiatis into the city of Thessaloniki. Later the students visited the galerian complex, which was built by the Roman Emperor Gaius Galerius in 300a.d. and it is consisted of the Rotonda, the Galerius Arch, the Palace, the Octagon, and the Hippodrome.